Justin Time Records announces the signing of New Orleans-based blues/rock guitarist Brent Johnson and will release his debut album, Set the World on Fire, on April 8. Johnson is backed on the new CD by his road-tested band of Bill Blok (bass, backing vocals), John Perkins (drums) and Wayne Lohr (keyboards), along with special guest guitarists Alvin Youngblood Hart, who adds his scintillating touch on three tracks, and legendary slide master Sonny Landreth on one song. 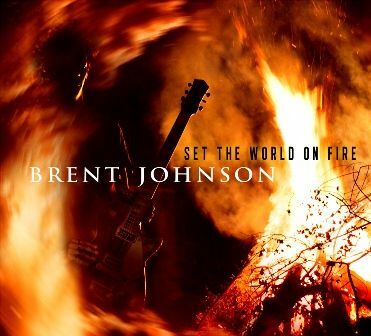 Set the World on Fire was produced by Brent Johnson and recorded/mixed by Ben Lorio at The Music Shed in New Orleans. "My sound is rooted in the blues, though I don't pretend to be a purist, and I don't want tobe," Johnson explains. "I write music based on my experiences and the sounds I grew up with;I never want to pretend that I had the same experiences as the old bluesmen did, so I'm not going to go around trying to sound like them. What I do is put the emphasis on the feeling of the music, the passion, the urgency, the directness - that's the goal."